We have a serious weakness for arts and crafts. The kind of high-quality, useful things you just can’t find in regular stores anymore. So, we made a pilgrimage to the One of a Kind arts and crafts show in Toronto this past November, with a special eye out for our specialty: reading and writing paraphenalia. Much of the show—hundreds of dealers and hours of browsing—was the usual run of pottery (not much, but nicely done), cutting boards (by the hundreds), various clothing (from nice to excruciating), and all sorts of food (both delicious and strange; some both.) And reading and writing? Pretty much a vacuum, with one notable exception: Robert Wu. To be fair, we met Robert at the same show, in it’s spring incarnation, earlier in the year. We liked him then, and thought we might come back just to see him again. And so there we were. Robert is a nice fellow, with a nice booth. No, make that a nice fellow with a breathtaking booth. You see, Robert is a craftsman in marbled paper who should have been born in Florence hundreds of years ago. As soon as he starts talking you can see the passion: his knowledge of the the history; the original techniques of marbling; the hundreds of hours of work—no, craftsmanship—on display. His skill is recognized by more than just craft show browsers and bloggers: his works are in the permanent collections of both the University of Toronto and Harvard University, and in private collections around the world. Paper marbling has a long and distinguished history, and the practice spans global cultures, East and West. The techniques used today are almost unchanged from those times: inks are floated on a thickened goop (technically “size”), things are done to them to produce swirling patterns, and fine paper is laid down on the ink to pick up the ink. Rinse, dry, and there is art! Robert’s background is in traditional European methods of book art: fine bindings, slipcases, and marbling. However, he has gone beyond the utilitarian with a series of marbling-as-art pieces, ranging from the representative (peacocks and trees) to the abstract (agate slice?) In browsing through the available pieces, you can easily tell from the subtle differences between each that this work truly defines that somewhat threadbare phrase: one of a kind. And being a quiet, humble sort of fellow has its drawbacks: he doesn’t charge nearly what he should. In the spring we bought an 18″ x 24″ Japanese wisteria print (no, not print. Depiction? Marbleization?) for a paltry $40.00, which now has pride of place on the dining room wall. 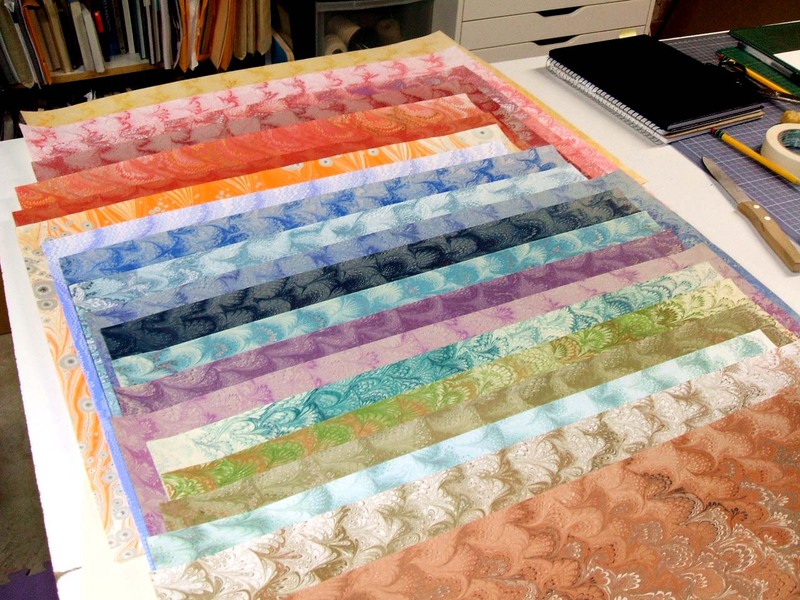 In November, we were looking for something different: traditional marbled paper for use in re-lining antique boxes. This is a well-established practice, especially in European stationery storage boxes. We are always looking for good suppliers of traditionally-produced restoration materials, and Robert didn’t disappoint us. He has a full line of suitable marbled paper, and is very open to specialty orders; a sample booklet can be had for $5. Everything is done by hand, by Robert, here in Toronto. We quickly found suitable paper for what we had in mind, and picked up extra in a slightly different pallette. The inks he uses are not the sort to flake off, and the paper is thin enough to fold, but heavy enough to resist wear. This is not be what we normally think of as paper: white stuff on which you write, preferably with a fountain pen. But it certainly is worth a category of it’s own: beautiful, historical, useful, wonderful. Make that categories. disclaimer: This is a review; we have no financial connection with this artist.